Post written by Duncan Law, Biofuelwatch. 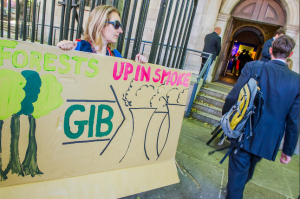 If you’re in or near London, please join Biofuelwatch and the new London Biomassive group for a protest outside the Green Investment Bank’s Second Birthday Celebration. We will be targeting their wilful, ongoing, not-green investment in Big Biomass and Waste Incineration. Please meet outside the Bank of America Merrill Lynch, 2 King Edward Street, London EC1A 1HQ (near St Paul’s) at 5pm. Click here for a map of the venue and the nearest tube stations. The protest will be an alternative street party with cake. Pete Deane and Chris Bluemel (of Seize the Day) will be playing. We will be handing out leaflets and cake. (volunteer cakemakers wanted). Representatives will attend the GIB event to present our vision of the future of the GIB. To find out more about the protest and the reasons for it, please go to http://www.biofuelwatch.org.uk/2014/green-bank-2nd-birthday/. If you use Facebook then please help us spread the word via this events page: https://www.facebook.com/events/1501053843475695/. Please come. Tell your networks. Many thanks.